Census Bureau National Program Manager Cathy Hartz discussed the possibility that a question of citizenship could be added to the Census for the first time, and why it's important to respond to the Census regardless. As required by the Constitution, the Census enumerators will begin collecting 2020 data next year. James Madison University President Jonathan Alger serves on the Complete Count Commission, an organization that works to develop a Census awareness plan. He told those gathered at the Lucy Simms Center that the upcoming year will bring about new challenges. JONATHAN ALGER: For the first time, people are really going to be encouraged to participate online. And so, that means obviously making sure people have access to be able to do that appropriately, that we make sure we get the word out about what that is and why it matters is going to be important. 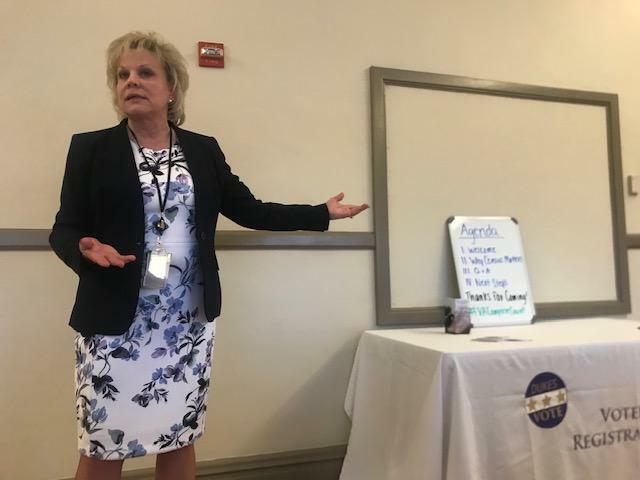 The Census Bureau’s National Program Manager Cathy Hartz also talked about the possibility that a question of citizenship could be added to the Census for the first time, and why it's important to respond to the Census regardless. The U.S. Supreme Court will rule on the question this summer. CATHY HARTZ: We hear why people are already not planning on responding to the Census and we’re trying, from a grassroots level, to change their minds a little bit. Whether or not that citizenship question is on there or not, it’s going to happen. By not responding or choosing not to respond, you’ve heard some of the numbers that have been thrown around, that’s the amount that is not going to go into your communities. Hartz stressed how areas such as Harrisonburg can be difficult to count not only because of the college students but also the growing immigrant population. She said she is reaching out to local leaders to help build the trust of immigrants, but it is difficult in this political climate. HARTZ: I just cannot stress enough that we are dependent on community trusted voices to help us through this. We’re trained to come together. We’re all citizens, whether legal, illegal. You live here. You have roads, you have hospitals, you have schools.